As I've mentioned before, along with addressing general education academic standards, we spend a lot of time working on functional life skills - these include community skills (CBI stands for Community Based Instruction - which is instruction that takes place *in* the community, but we also learn about the community from inside our classroom before venturing out - particularly learning to identify different places in the community and community helpers or occupations), survival skills (like being able to answer personal information questions to tell someone your name or your parents name in case you get lost), communication skills, social skills, etc. Here's an idea for a unit that encompasses a TON of skills and gets everyone in the Christmas spirit. We spent the last two weeks of school doing this this year. The unit revolves around Christmas cards (or holiday cards in general) - this is also a good unit to use around Valentines Day with Valentines cards. We made photo cards this year - so it all began with the photo sessions - sitting, following directions, imitating facial expressions (we made some silly face photos, too), looking when name is called, imitating words (cheeeeeeeese), waiting your turn. I took each kid's picture in front of the tree in the front office lobby. After the photo cards were developed, we worked on things like identifying photos of self and labeling classmates photos. Whatever kind of card you use, signing the card allows for handwriting practice (tracing/writing own name and/or copying from a model). You can also have the students draw pictures or write/copy messages inside the card. Next comes dictating or writing personal information (parents' names, address) to address the envelope. For higher functioning kids you can get into the difference between the mailing and return address. I use printed labels for the return address - the students have to find the ones with their name on it (identifying own name in print) then I point out the school address and have them tell me what school they go to and who their teacher is (more personal info questions). We also look at the addresses and identify letters and numbers. Next we talk about where the stamps go on the envelope - we talk about top/bottom and right/left and learn to identify "corner". 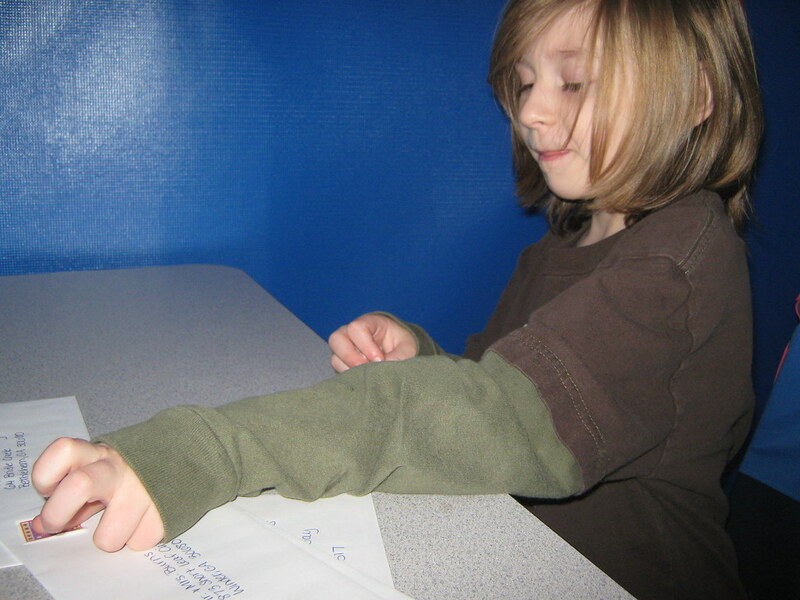 We use a highlighter to place a dot in the top right corner of the envelopes where the stamps will go. (This year we actually put most of the stamps on before we went to the post office because we were mailing tons of cards - we sent them to our principal, asst principal, former parapros, former student teacher, and many other friends of our class). After we've finished all of the writing on the envelope, it's time to stuff the cards inside - 1:1 correspondence, fine motor, and pre-vocational skills as well. There are tons of additional activities you can do with this - talk about shapes (envelopes are rectangle and the little flap is a triangle), use different colored envelopes and sort them by color, talk about mail and how it gets from one place to another, discuss postal workers and post offices, and lots more. We spent over a week on all of this and could easily have spent more. Now we get to the actual CBI trip. Off to the post office we go! Using either visual cues, a communication board or book or an AAC device, students purchase stamps from the postal worker cashier (working on communication, counting money, waiting for change). Then they place the stamps on the envelopes (fine motor and visual motor to match the stamp to the dot they drew there before). Finally we get to put the cards in the mail slots or mailbox to send them out. Many post offices will give the students a tour and explain to them how the mail gets from the slot onto the truck and then to their house. And the best part is when the parents recieve the cards in the mail! 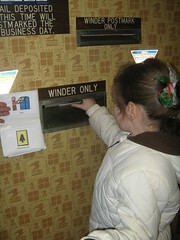 Visit my class blog to see more photos of our CBI trip when we mailed our Christmas cards. I hope everyone had a very Merry Christmas (or Happy Hanukkah or a wonderful winter break in general)!! 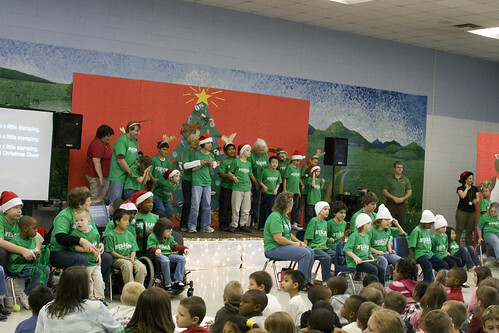 Fellow teachers - how do you celebrate the holidays in your classroom? performance2-148, originally uploaded by MNicoleM. Here's a slideshow of photos from rehearsals and one of the Thursday morning performances. To see video of the other Thursday morning performance and of the performance at the PDC, visit my class blog. 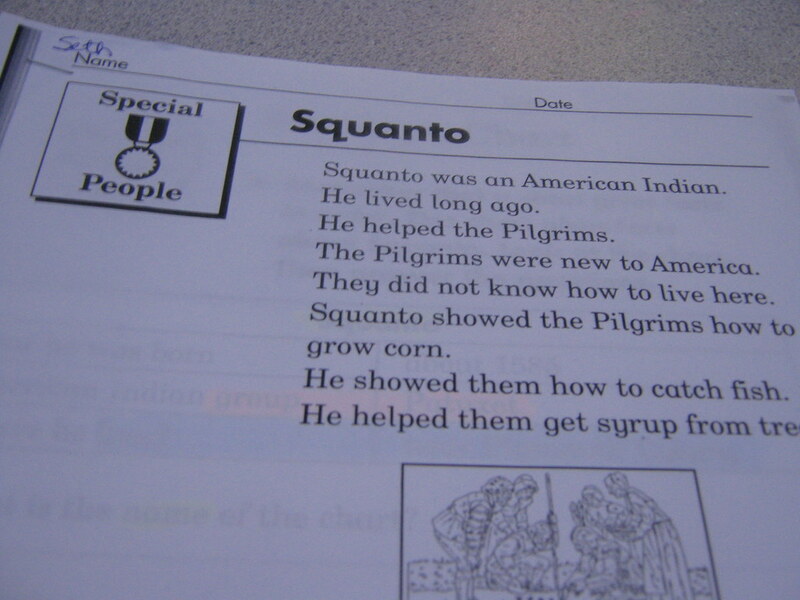 Here is an example of how I adapted a worksheet about Squanto. The worksheet is from a 1st grade Social Studies workbook, the skill addressed is using a table to find information to answer questions. This first adaptation is for a student who is working on matching colors. 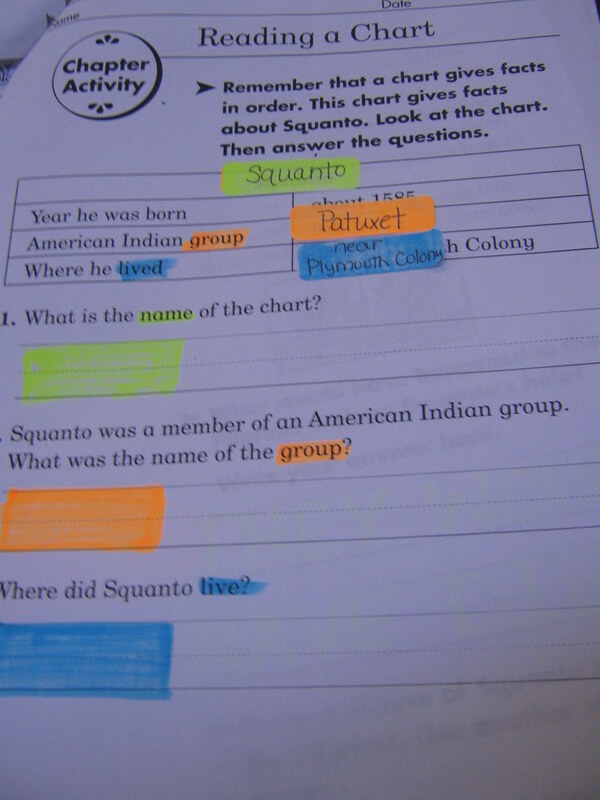 I have placed re-positionable labels that I have color coded with highlighters over the chart and used the highlighters to mark matching colors in the answer blanks. 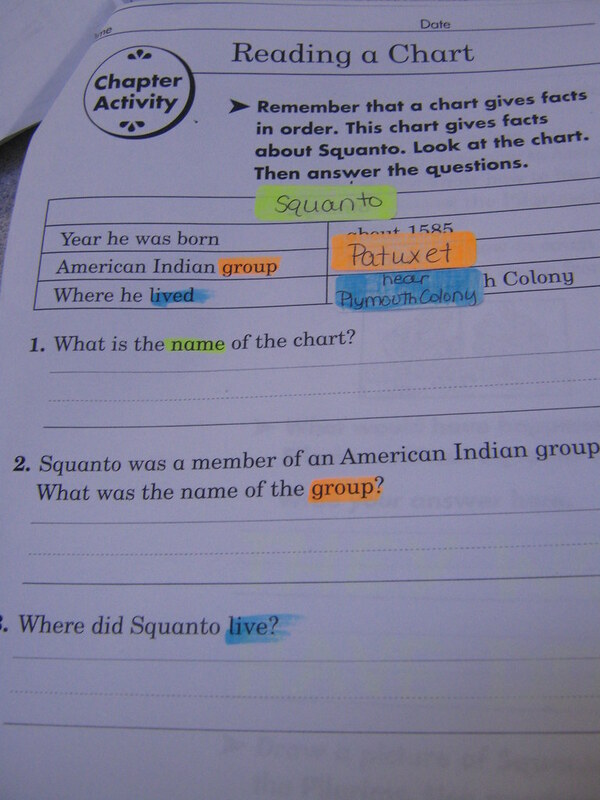 The student removes the label and matches the color to place the answer on the worksheet. This one is similar but doesn't have the highlighted squares on the answer sheet. 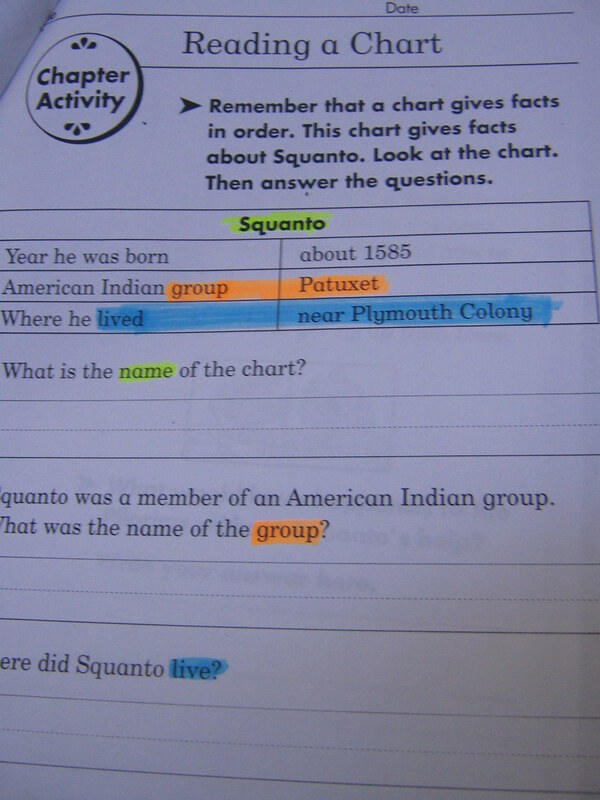 The color cue tells the student where in the chart to look, and they remove the label and place it in the answer blank. This last example is the least modified - the color cues show the student where to look on the chart but the student still has to copy the answer into the blank. You'll notice I only highlighted the key words to help the student focus on that - teaching them to look for those words to find the answers.